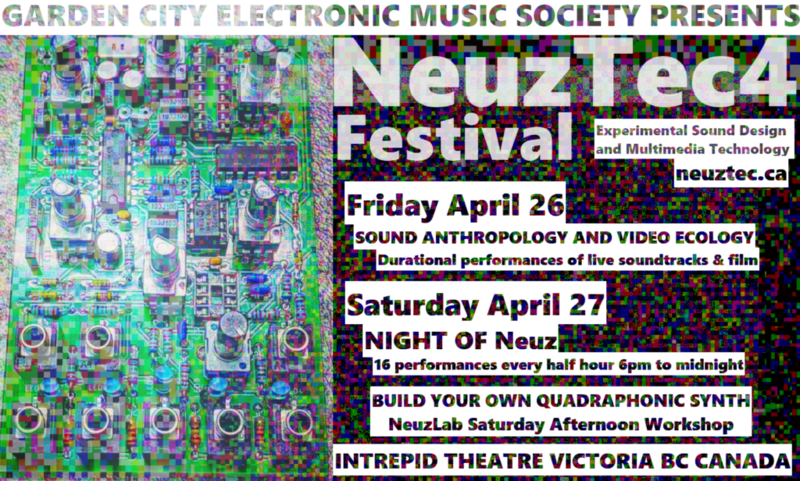 NeuzTec is a Festival of Experimental Sound Design and Multimedia Technology. NeuzTec seeks artists and researchers involved in sonic artforms that employ technology in new or experimental ways. Performers at NeuzTec! Festival are exploring DIY electronics, modular synthesis, out-there Max-For-Live patches, machine carpentry, instrument re-engineering, and other magic for creating visceral sonic and immersive visual experiences. NeuzTec is an all-ages, sound art community and features a full quadraphonic concert PA system to test sonic experiments on. NeuzTec is a safe and inclusive space for the wondering minds – a mix of sound art enthusiasts and a curious and unsuspecting public. We strive to host the event for all ages, youth are free, and we hope that our festival is a safe space for everyone to enjoy, whomever you are.